Between April 20 and April 24, notable shareholding changes in companies listed on Bursa Malaysia included that at Country Heights Holdings Bhd (fundamental: 1.05; valuation: 1.7). Singapore-based Joint Win Investment Ltd, which was incorporated in the British Virgin Islands, emerged as a substantial shareholder of the property company on April 15, after acquiring 16.94 million shares or a 6.15% direct stake. On April 15, Country Heights founder and deputy chairman Tan Sri Lee Kim Yew’s Bee Garden Holdings Sdn Bhd sold 2.66 million shares at RM1.20 apiece in a direct deal, paring his stake to 59.94%. The stock was untraded that day but stock market data shows another 544,900 shares changed hands at RM1.25 apiece. The counter closed at RM1.28 on April 28. Omesti Bhd, formerly known as Formis Resources Bhd, saw vice-chairman Datuk Mah Siew Kok buy 20 million shares or a 5.16% stake from chairman Tan Sri Megat Najmuddin Megat Khas. Ten million Omesti shares were transacted on April 21, and another 10 million the following day, when the counter closed at 51 sen and 55 sen respectively. Following the transactions, Mah’s stake has been raised to 21.73%, while Megat is left with 8.03%. Omesti (fundamental: 1.05; valuation: 0.9) is mainly involved in the distribution of IT software and hardware. Over at Niche Capital Emas Holdings Bhd (fundamental: 0.75; valuation: 0.00), United Overseas Bank (M) Bhd ceased to be a substantial shareholder on April 15 after disposing of 12.1 million shares or a 4.5% stake. The buyer is likely the gold jewellery retailer’s managing director Mah Weng Kee. Filings show that he bought 12.1 million shares on April 15 at RM1.27 million and sold the block a week later on April 21 at the same price, which works out to 10.5 sen apiece — 43% cheaper than the closing price of 18.5 sen on April 15. Mah could have sold the block to Yee Shia Ming, who bought 12.1 million shares at undisclosed prices on April 21, raising his stake to 20.6 million shares or 7.67%. To recap, United Overseas Bank received the Niche Capital shares in a debt restructuring scheme, and the bank exercised the put and call option agreement dated June 30, 2014. The share price of Icon Offshore Bhd fell by 8 sen or 11.8% after the company announced on April 22 that the Malaysian Anti-Corruption Commission had remanded CEO Dr Jamal Yusof and his brother, chief operating officer Rahman Yusof, to facilitate and assist in investigations. 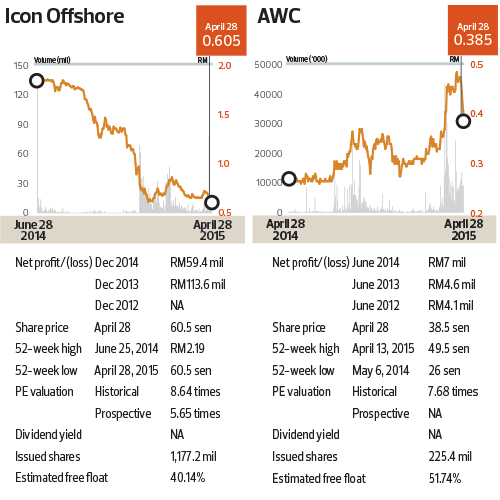 Year to date, Icon Offshore (fundamental: NA; valuation: NA) has declined 14 sen or 18.8% to close at 60.5 sen last Tuesday. It is worth noting that on April 20 and 21, Jamal Yusof sold two million shares or a 0.17% stake for RM1.42 million, or an average price of 71.3 sen apiece. 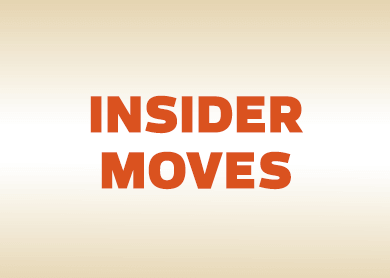 Filings also show that independent non-executive director Edwanee Cheah Abdullah sold 1.32 million shares on April 21 for RM940,271, which translates into 70.8 sen per share on average. Shares of the offshore support vessel provider closed at 71 sen and 70 sen on April 20 and 21 respectively. Meanwhile, AWC Bhd dived 19%, or 9 sen, to 38.5 sen last Tuesday. It rebounded to close at 412.5 sen last Wednesday. The share price retracted as Md Shah Abu Hasan ceased to be a substantial shareholder after selling 10 million shares or a 4.43% stake on the open market on April 20. He still owns about 3.4% equity interest in AWC. Md Shah, 63, who is from Ipoh, has been accumulating AWC shares since last November, raising his stake from 5.32% to 7.83%. Year-to-date, however, AWC has risen 8.5 sen or 28.3%. AWC (fundamental: 2.8; valuation: 1.1) provides integrated facilities management services to building owners, including electrical distribution, lighting, air conditioning and security, as well as pneumatic waste conveying system. This article first appeared in Capital, The Edge Malaysia Weekly, on May 4 - 10, 2015.